For native tribes there was no boundary separating what is now White Acres from the rest of the hogbacks area. 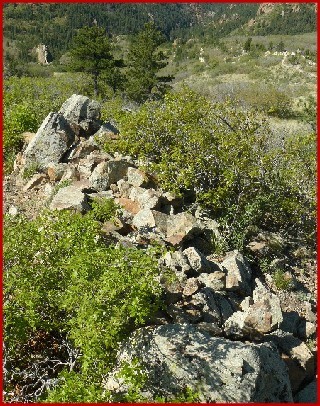 On White Acres there are remnants of the ridge crest stone wall which is prominent to the north in Red Rock Canyon Open Space. (see: Utes along the Hogbacks.) There are at least two likely campsites near White Acres. And, the area probably saw considerable use before it was first visited by people of European origin. John Langmeyer homesteaded a tract of land which included what is now White Acres and secured title to the property in 1875. John and Fredricka Langmeyer were partners of Colorado City founder Anthony Bott in Bott & Langmeyer Building Stone which quarried the White Acres area extensively in the late nineteenth and early twentieth centuries. Historical accounts strongly suggest that stone for General Palmer’s Glen Eyrie castle came from White Acres (despite what Marshall Sprague wrote in Newport in the Rockies). Today the quarry sites are seen as the light colored rock faces on the Dakota hogback. Most of the wagon roads which served the quarries can still be seen. In January, 1900 Fredricka Langmeyer sold a 100 foot wide right of way to the Colorado Springs and Cripple Creek District Railway Company. The northwest boundary of that right of way is now the southeast boundary of White Acres. For the middle third of the twentieth century, White Acres was owned by W. C. and Pearl White. During much of that time Mr. White used the property to graze two or three horses. From around 1935 to 1955 the Whites lived in Bear Creek Canyon. Then in 1955 they built a new house at the corner of Gold Camp Road and S. 26th. Street (see map). 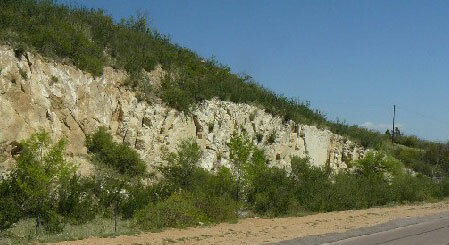 For a short time in the mid-twentieth century limestone was mined along the east edge of the property partly in the Gold Camp Road right of way. A few people have said that the White’s heirs decided to donate the property to the Bethany Baptist Church because the they wanted the property to retain its character rather than being developed into a hillside subdivision. The Church gave the property the name ‘White Acres’ and developed a small part of it for outdoor worship services and other events. This development includes a pavilion, a play area and a parking lot. 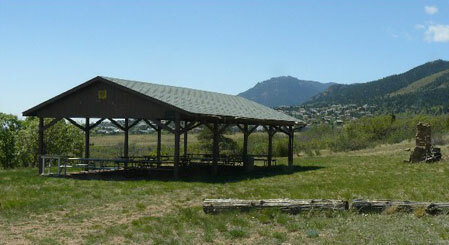 With the help of funds raised by Friends of Red Rock Canyon and the Palmer Land Trust, White Acres has been added to Red Rock Canyon Open Space. Unlike the major parts of Section 16 and Red Rock Canyon, White Acres has yet to be permanently protected by a conservation easement.